Dimensions: 5 1/8" x 1 3/4" x 1/16"
This exquisite Cross is crafted from metal and features an ornate design with a raised figure of Jesus. It is finished in an antique gold. 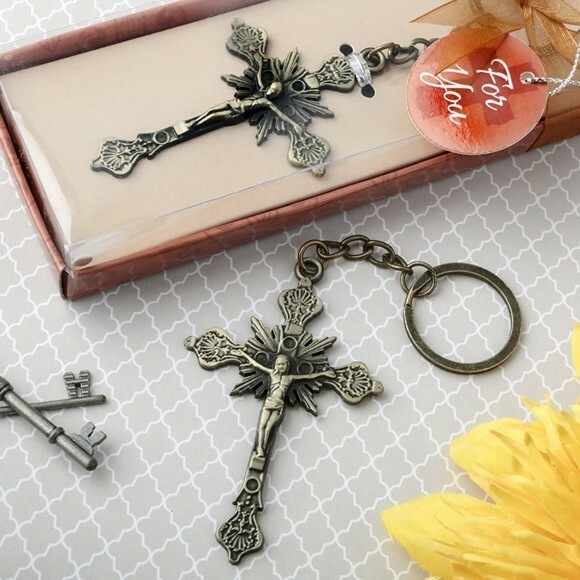 Attached to the cross is a matching antique gold metal key chain and key ring. Attached to the ribbon is a cross-themed 'For You' tag. A thoughtful and useful favor for christenings, communions, baptisms and other Christian themed events. Sold individually. Pictured keys are not included.